This guide references all available events, conditions and actions that can be found and used in the Rule Builder. For information on how to create, execute and test rules, please refer to the How to Work with Rules guide. When the order is imported either from a shopping cart or from an import template. This event only happens one time. If you set up rules on this event after orders have already imported, it will not work on those existing orders, but will work on orders as they import, moving forward. You can execute this event on orders or a folder if you need to apply it to old orders. When the order is manually added to Order Desk from the Add New Order page. When an order moves from one folder into another. If using this event, for the rule to work, make sure to add a condition that specifies the ID for the folder that orders should have moved into, otherwise it will run on every order every time it moves into any folder. When the order is confirmed from the dropship email. 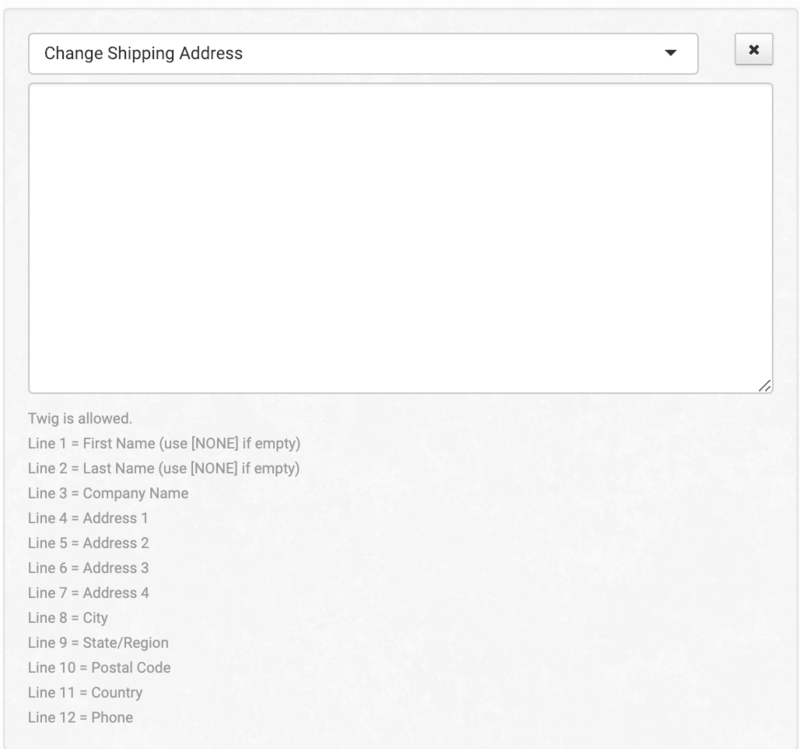 If you are sending any dropship emails using the default template, there is a button in the email that the recipient can click to confirm they received the email and order details. When this button is clicked, the Order Confirmed event is triggered. When an order is split into two or more orders. This can be done manually by clicking the Split Order button or with split rules. This specifically refers to the information found by clicking on the Edit Order Details button, not anything changing anywhere in the order. When any details about either the shipping or customer/billing address are changed on the order. When an item in the order is edited. When an order is moved from one store into another store with a rule. This rule must be set up on the receiving store. When an order is copied from one store into another store with a rule. This rule must be set up on the receiving store. When a PDF is created on an order with a rule. We recommend using this event sparingly and with caution; It is easy to click the print button without realizing, and there may be other actions tied to it from a rule. When a tracking number is added to an order. When a tracking number is deleted from an order. Right before a file is imported, take action. When order JSON has successfully posted to the endpoint specified in another rule. When orders have been exported, either manually or from an appointment. These events will be unique to the integrations and will not show up unless the integration is enabled. Operators tell the rule how to compare and check the value with the field. equals Must be an exact match. Case, space and punctuation sensitive. not equal to Is not a match. >= Is greater than or equal to. <= Is less than or equal to. not in Is not in this list of items. like Is like this value. Similar to = but allows for minor differences. not like Is not like this value. starts with Starts with these characters. does not start with Does not start with these characters. ends with Ends with these characters. does not end with Does not end with these characters. before time If the current time is earlier than the target time being looked at. after time If the current time is later than the target time being looked at. The value will vary depending on the field and operator being used. 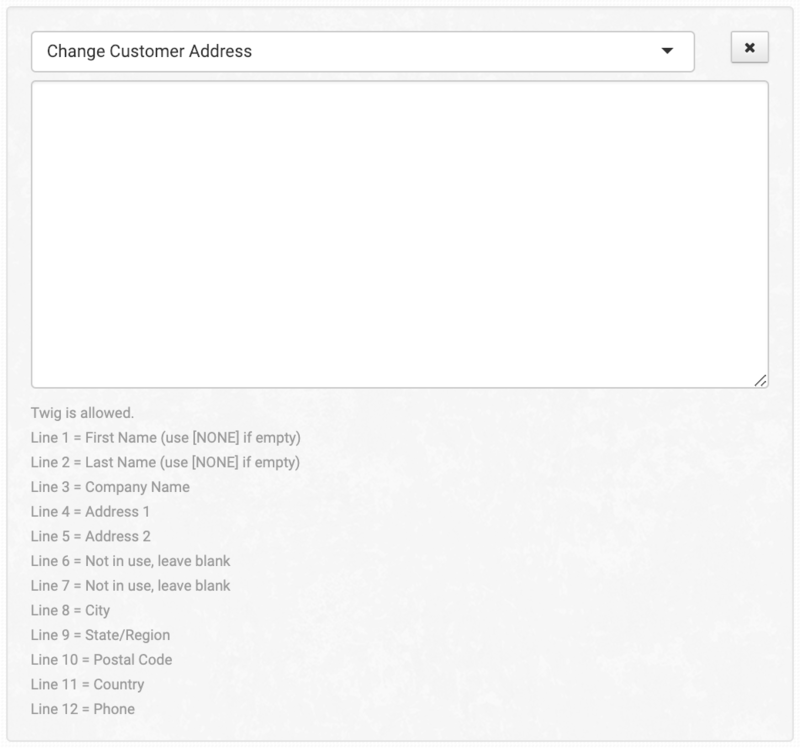 When using checkout data or metadata, use name|value. When creating a new rule, you will have to select whether you want the rule to run on the order or on an item in the order. If you select Change Order, these are the actions that will be available in the rule. They will affect the entire order if the conditions apply. Move the order into a different folder. Set a new or different shipping method on the order. If the shipping method is X, change it to Y. You can enter multiple filters, one on each line. A simpler method is to simply use the Set Shipping Method action which lets you change the method directly. If the shipping state is X, change it to Y. You can enter multiple filters, one on each line. If the shipping country is X, change it to Y. You can enter multiple filters, one on each line. Tag the order a specific color. Split the order into two or more orders. This example would create four copies of the order on these dates relative to the original. Move the order into a separate store on the same account. This will remove the order from its current store and place it into another one. Copy the order into a separate store on the same account. This will leave the order in its current store and create an additional version in another one. Send an email to the customer on the order. This is also used to send an email to a vendor or other party if their email address is added to the template Email Delivery Override. Queue one email to be sent to customer six hours after the first tracking number has been added. This allows time to add multiple tracking numbers to an order in the six hour window to reduce the number of emails the customer might get. Send an email to the admin of the Order Desk account. The admin email is set in the Store Settings. Enter the URL of your custom endpoint and a JSON representation of the order will be sent to this location. If your server responds with anything other than a status code of 200 or 201, Order Desk will keep trying. Reduce the stock quantity of the order items from your Order Desk inventory. Add quantity from order items to Order Desk inventory. Choose a preset return address to be applied to the order. Enter the URL of your custom endpoint and a JSON file of your inventory items will be sent to this location. Add a timestamp to the order in the store's local time. Add a timestamp to the order in the UTC time. Add custom order metadata to the order. Must be formatted name|value. Add custom checkout data to the order. Must be formatted name|value. The same examples from checkout data will also apply with metadata. Add the URL from a PDF to the checkout data of an order. to add a number to orders without one. Sync inventory details saved in Order Desk into the same items in the order. Convert prices to account for different currencies and conversion rates. The percentage must be manually changed on occasion to reflect current rates. Split multiple quantities of the same item into separate line items in a single order. If any items in an order have the same SKU but are on separate lines, use this action to combine them back into a single item with multiple quantities. Add a prefix to order number. Add a suffix to order number. Duplicate order numbers cannot exist in Order Desk, so consider using Twig in this rule to create unique order numbers for each order. Most shopping cart integrations will re-import orders that have already been imported into Order Desk when the order number changes on the assumption that the order isn't in Order Desk. At worst, this can create a loop where orders are continuously imported and reimported. At best, you may unintentionally fulfill the same orders multiple times because they have different order numbers in each instance. Please use this rule action carefully. Add a new item to the order. Add a tracking number and other shipment details to an order. Because this is a static field, this is best used for adding n/a to orders that won't have a tracking number but need the Shipment is Added event to be triggered. Create a PDF out of a receipt template. Add any order desk field names, separated by a comma, that should be capitalized in the order. List of field names can be found here. Change the Payment Status on the order. Remove the last 4 digits of the 9 digit US postal code, leaving only the 5 digit zip code. Changes the full state or region name to the 2 letter abbreviation. For this to work the country name must also be abbreviated. 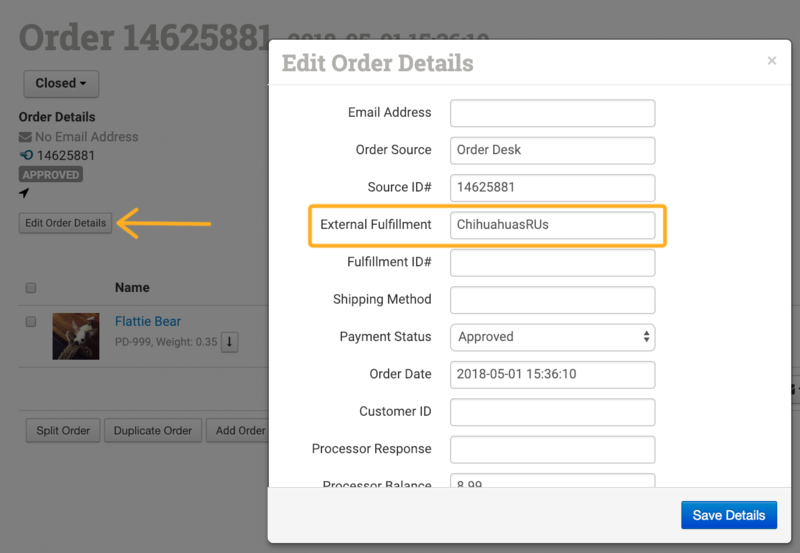 When submitting orders to an official Order Desk integration for fulfillment, the integration name will automatically be added here, so a rule is not necessary for these orders. This is the email address for the customer, which can be used to communicate with them from Order Desk. Add the amount to be added as the tax total on the order. Add the amount to be added as the shipping total on the order. Remove the discounts from the order totals. Available for the Easypost and Artsadd integrations. Use this action to delay when the shipment added event runs on shipped orders. For more details see the Artsadd integration guide or the Easypost integration guide. We recommend setting up a custom button with this action. For details, see the How to Use Custom Buttons guide. This action will delete all variations from the items in the order. Cancel the event that is supposed to run for any orders the rule you set up would otherwise apply to. The alternate option to this is to use the Send Email to Customer rule action and set the email address in the Email Delivery Override field. Details here. These actions will be unique to the integrations and will not show up unless the integration is enabled. If you select Change Order Item, these are the actions that will be available in the rule. They will only affect the item in the order that the conditions target, or, if no conditions are used, they will affect every item in the order. Change the name of the item to the name written into this rule. Enter a new SKU (code) for the item in the order. Add metadata to the item. Item metadata cannot easily be edited or removed once it is on an item. If you need to be able to edit what you add, use Set Order Item Variation instead. Item metadata can also be added directly to inventory items in Order Desk and synced into the orders on import. Details here. Add or update the location of the item. The location is a specific item metadata field. More information on inventory details, including the location, can be found here. Change the quantity of the item in the order. Change the price of the item in the order. Change the weight of the item in the order. Add custom checkout data to the order. If you are unfamiliar with checkout data, learn more here. Add custom metadata to the order. Remove the item from the order.